In this case, I’m talking about smart farmers. They’ve scattered produce carts throughout the city, so that whenever you like in August, you can get farm-fresh corn – right after work, right before dinner, right by your apartment or your house. These corn carts led to the Summer of Corn 2008 in our household. The Summer of Corn 2008 involved eating corn pretty much every evening and meeting my new favourite relish: corn relish. 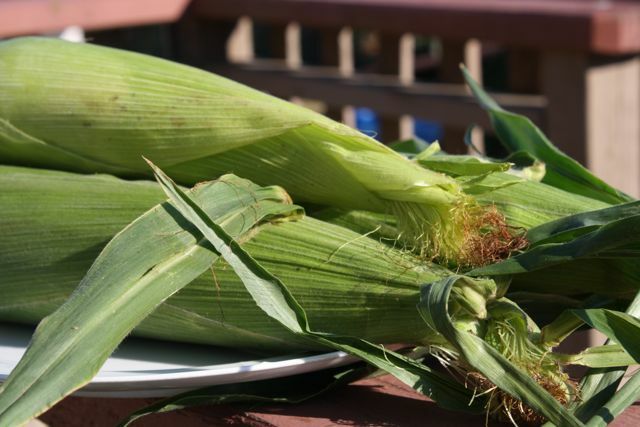 We’ve tried to replicate the Summer of Corn on Vancouver Island and are fairly successful – but we have to drive up the peninsula and out to the farm to get it now. Not quite as handy, but we’re glad we still have access to tasty, local corn. We officially began the Summer of Corn 2010 this afternoon, as we made our way out to Silver Rill Farm and joined the hordes of city folk rummaging through wooden bins to find the best cobs. We kept thinking back to the first Summer of Corn with fond memories, and then I remembered: rosemary corn butter. This recipe was born out of necessity on a late August day. We had been invited to a potluck dinner, but it was far too hot to stay inside and cook. What to bring? Since it was the Summer of Corn 2008, you may not be surprised with what we came up with. I wanted to dress the corn up a bit and we had rosemary growing in our miniscule deck garden . . . 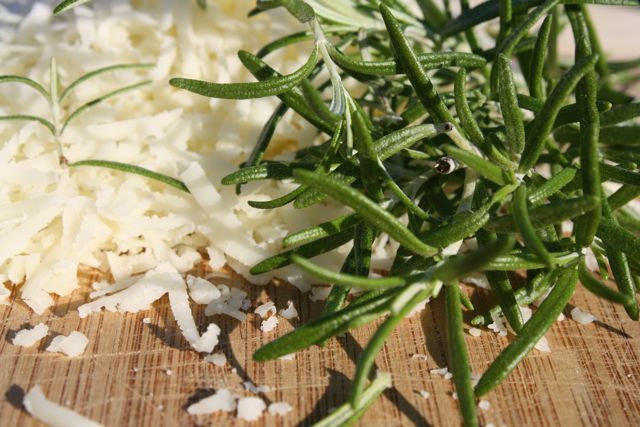 I minced a bit of rosemary, grated some parmesan, and pushed it into some butter. Our potluck dish was as well received as anything I might have spent two steamy hours toiling over a hot stove to achieve. For the Summer of Corn 2010, this corn is a good consolation prize. 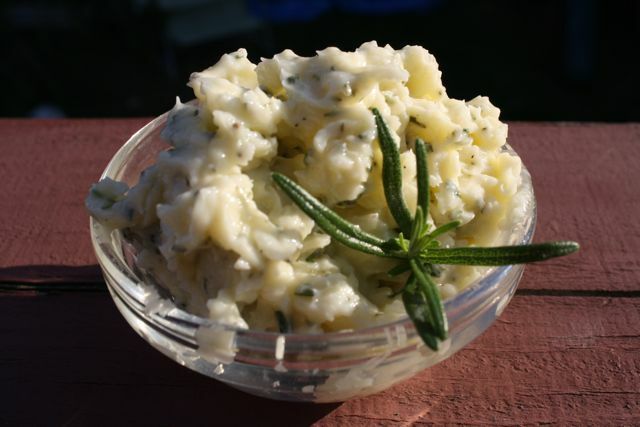 We may not have handy-dandy corn carts all over the city, but we do have this easy, dressy butter. 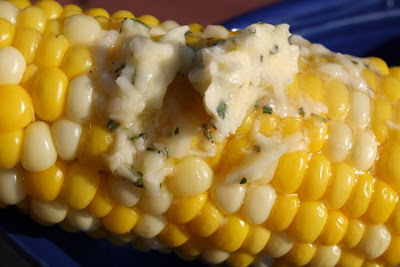 The rosemary and parmesan stud the butter with a perfect salty foil for sweet, crunchy corn. It only takes about 5 minutes to make – just while your corn is coming to a boil. If you are feeling fancy, you could grind some sea salt and peppercorns into the butter, too – but I don’t think that’s strictly necessary. Use the back of a strong spoon to push the rosemary and parmesan into the butter. Mix well. Serve in a little bowl. Garnish with another sprig of rosemary, if you like. Spread butter lavishly on each cob.